This was my 10th year riding Idaho City. It's the highlight of my year....absolutely look forward to it. The past two years, I've ridden it with my oldest son (he was on a mini in 2009 and we made it 40 miles, last year he was on a 200SX and he made the entire course despite sloppy conditions, but hour'd out at the check just above town). This was the year he was set on competing and doing well and I was really really looking forward to it. We were both signed up in the A class. He had a new bike (KX250F) complete with Rekluse Core EXP (thanks Idaho Joe) and was setup for the event. A week ago Friday while laying down some laps at the local MX track, he broke his wrist. So....time for Plan B (literally). I phoned up my brother who hasn't been on a bike for four years and he took my son's spot and I dropped to the B class to ride with him. Unfortunately, I didn't see my brother again after we hit the singletrack due to the tight schedule. I rode what I thought was an average B schedule pace and much to my surprise showed up to the first check 15 seconds late. I then knew it was time to turn it on a bit. I was waaay back in the B's (row 93) so was doing a lot of passing but I didn't really care because I was enjoying the most incredible ride/race in the world in perfect conditions and getting accustomed to riding my son's new 250F (my brother rode my 300). I was skeptical of the whole "triple gas" thing, but in the end, I really liked it. It was great for the pit crews to be able to see their riders more than once, and for me, it gave me a chance to relax more and fuel bike and body properly (although I only had 40 seconds and made my minute when coming in off the "pink flamingo" loop due to all the bottlenecks). About mile 70 I started cramping something fierce. I've been so focused on my boy's riding and racing the last year or two that I've hardly any seat time myself and it showed in my conditioning. Thigh cramps, hamstrings, toes, you name it.....if it moved it was cramping. I pushed through it and caught a few second winds and actually felt faster in the later special tests then the first ones. I was figuring out how to ride the 250F (throttle pinned) and getting accustomed to the stiffer MX suspension. The bike preferred to be ridden aggressively and attack the bumps (but all those downhill water breaks were killing me). I will honestly say that the Rekluse Core EXP was an absolute lifesaver!!!! I had the bike geared down one tooth on the countershaft and everytime I came to a traffic jam, whatever obstacle was causing problems was basically a non-issue and I was able to just lug right up everything. I was super impressed with the bike and clutch combo. I was actually looking forward to the uphill rutted turns because the bike was so much fun to turn in those things. I took the "Hard" option on the Hard/Easy route assuming that there had to be some kind of time penalty (longer portion of course) for taking the Easy route. The "Hard" option seemed to just be more of all that incredible new trail that was cut so tight between the pines (I wished I had a picture of some of those sections). In the end, I dropped 4 minutes at the last unassisted gas check scrambling to try and find my gas can, and then 2 more minutes at the last check above town. This was the tightest schedule I've ever ridden at Idaho City, but easily some of the best conditions I've ever ridden so I didn't really care. The only thing that would have made it better was if I could have been railing those same trails behind my son. Last November I guided a group of 16 dirtbike riders thru the 10-12 mile section of Arch Canyon that is open to motorized travel. We stopped and viewed (mostly thru binoculars) about 10 archaeological sites along the way. We took a short hike to a natural arch at the end of the motorized route (@ National Forest Service Boundary) and enjoyed lunch under the Ponderosa Pines (with a visit from a Tarantula) before riding back out the way we came. Arch Canyon is WONDERFUL and the road thru the canyon provides access for people to visit THEIR public land via a motorized vehicle. I applaud the Monticello BLM office for their decision to keep Arch Canyon open to motorized travel. I applaud their decision to institute a Recreation Management Plan designed to enhance the experience of visitors and to protect the archaeological resources in the canyon. Fall is a wonderful time to visit Arch Canyon....the stream flow is low, the Fall colors are vibrant and the temperatures are comfortable. If you've never been to Arch Canyon, I suggest you put it on your "must see" list. Whether you hike, bicycle, ATV, dirtbike or 4x4....it doesn't matter what your mode of transportation is, just get out and enjoy this wonderful piece of YOUR public land. Last Friday was a special day......August 20th to be exact. Why so special? 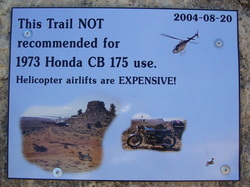 It was the 6th Anniversary of the Airlift from the Waterfall Trail. As is customary for the "Rescue Crew" we met at the "plaque" for a celebration, commemoration, or just reliving of that very strange day back in 2004. Go to the MORK OF THE DESERT page to relive this exciting adventure! !